There is something very enigmatic about Catalan that just sets it apart from the competition. It is a restaurant I have visited on a few occasions and every time it has carried me to another place. On a previous visit my dining experience moved me to the point where I felt Pablo Naruda pulling at my heart strings (Catalan and Naruda ). 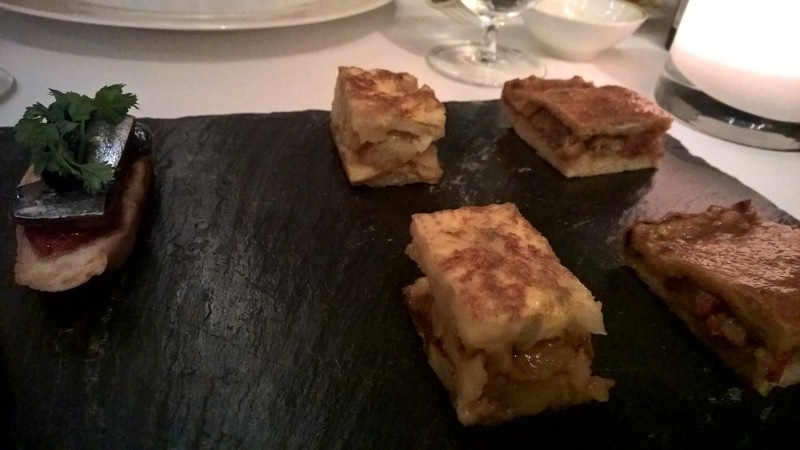 Of course, that evening it was Chef Francisco's Tasting menu with all the elements of a bespoke experience. On this occasion, when I knew I was going for what is marketed as a Barbeque & Wine Dinner, at no point did I shrug my shoulders and go, "Are they serious?" If anything, I was intrigued. I could see all sorts of possibilities. La Cava and Catalan remain the only bar and restaurant outlets in a hotel that work in sync to give the guest a red letter experience. Again, on this occasion, my evening starts off in La Cava with a drink and Iberian cold cuts. It is of course appropriate considering that the Barbeque & Wine Dinners feature a wine pairing created by Rosewood's resident sommelier. As the gods would have it, this evening is all about Champagne. 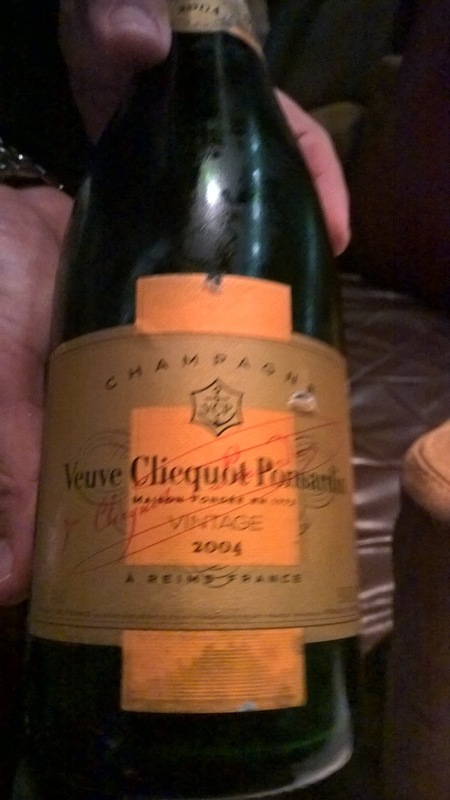 Our Pre dinner drinks at La Cava is the Veuve Cliquot Brut 2004. I cannot complain about getting the evening started in this way. Timeout Abu Dhabi's Wine Bar of the year 2015 has given La Cava an accolade well deserved, although in fairness, it has no competition to speak of. A short while later, my guest and I make our way to Catalan. As we approach the restaurant, I can hear the clinking of glasses, clanking of cutlery and the buzz of chatter. The restaurant is quite full - a Monday night, something rarely seen in Abu Dhabi. I am seated and I can feel the atmosphere is different to what I have experienced before. I cannot help feeling nostalgic and miss the passion and warm smile of former Restaurant General Manager Jordi Vicente, who has since left Abu Dhabi. 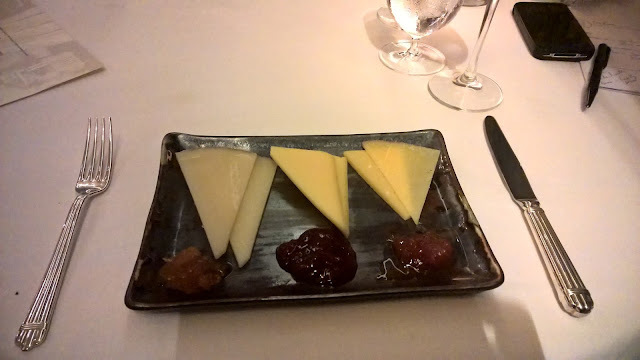 Tonight I am seated at my usual table and a waiter I have connected with on a meaningful level greets me, all of which serve to deepen the gap I feel with Jordi missing, but that is the nature of the hotel industry in the city. 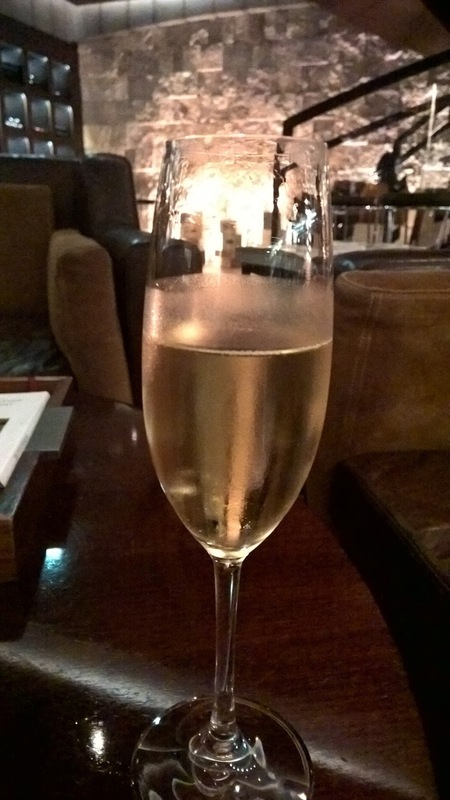 My wistful reflections are welcomingly interrupted by the waiter as he presents the second Champagne for the evening. It is from my two favourite houses. 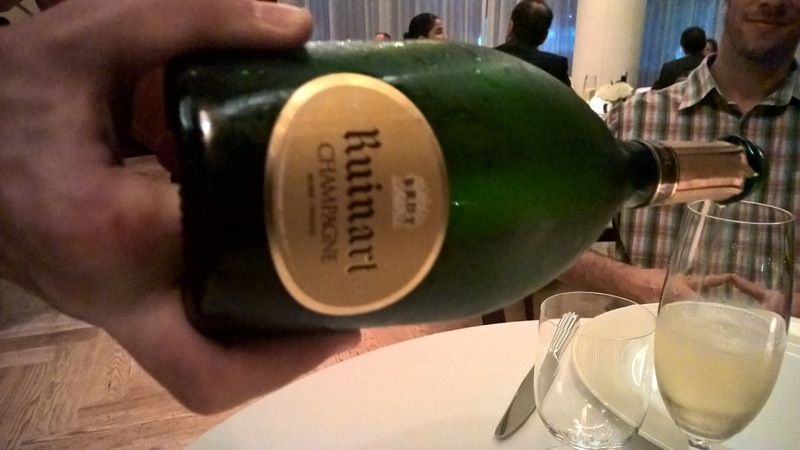 The Ruinart Blanc de Blanc and Billecart-Salmon are my favourite NV Champagnes, but tonight it is the "R" de Ruinart, comprising Chardonnay, Pinot Noir and Pinot Meunier as opposed to the Blanc de Blanc which is a Chardonnay. It is fresh and fruity, not as elegant as the Blanc de Blanc but endowed with a wonderfully long finish. Mmmm. 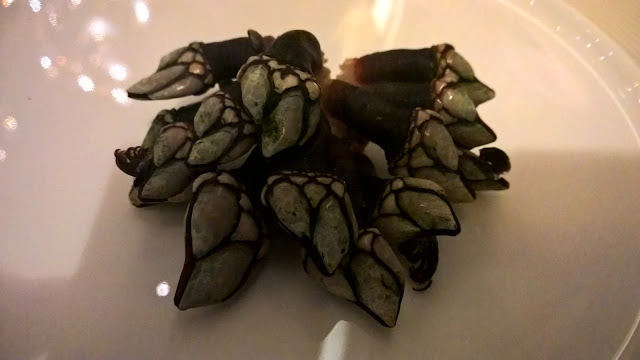 Before our starters, we are served Percebes, or barnacles as they are known in English. They don't look appetising. They do not even photograph well, but having tried them before, I love them. They are served. I can discern a bit of steam rising. Freshly steamed. I twist, rip and eat them. They are all sea. Different from oysters, but filled with the same power to evoke the seaside for me. Excellent. Soon after our barnacle experience, we are served our appetisers. 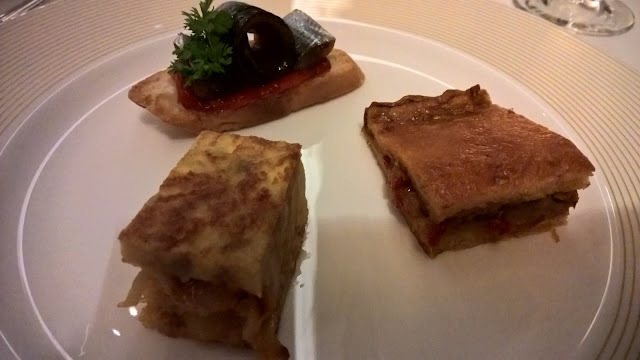 Sardines on roasted pepper toast, Spanish potato with sea urchin omelette and Cod fish Empanada are tastefully and simply presented on a black stone plate. It is a plate of contrasts. The saltiness of the sardines and the crunch of the brioche are foiled by the delicately natural sweetness from the cod which in turn contrasts further with the lightly flavoured potato and mildly creaminess of the sea urchin. We return to the Veuve Cliquot 2004. I do like Veuve. The NV is an all round good Champagne, and the 2004 does not disappoint. 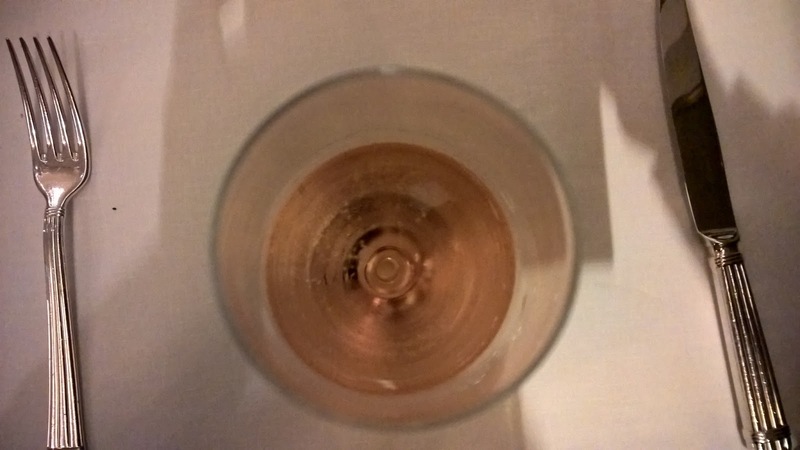 It is citrusy, creating freshness on the palate, and the bubbles, vivacious, but finer than the NV. Interestingly, I have the last glass of a bottle that had been open a few minutes longer than my guest's. I am pleased. Mine tastes softer and the bubbles are less intrusive. Gracious. For starters we are served a sharing platter of Octopus A Feira and Mussels A la Marinera. 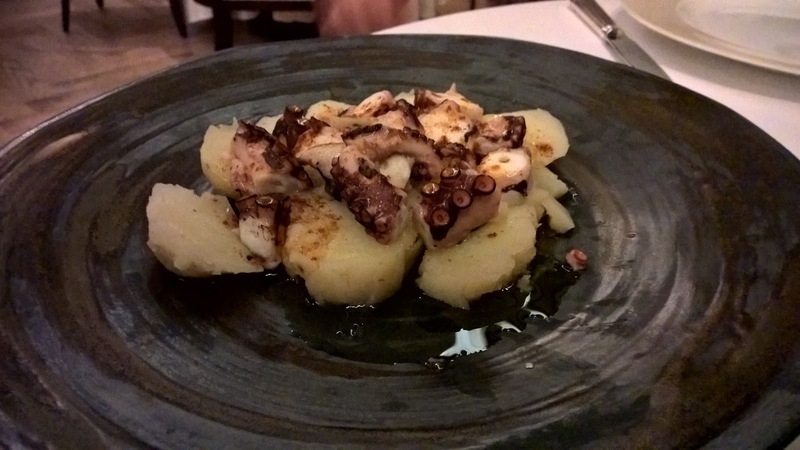 The key to the first dish is the way that the octopus is cooked. By now I have come to expect octopus to be chewy, rubbery and uninteresting. It is usually part of a dish to give texture - up to now that is. I have never used the word 'tender' to describe octopus. But there is no other word more appropriate. Finally, the mussels have the most delicious broth and after finishing the mussels, my guest and I look at each other, smile, and dip some bread into the broth. That is a really appetising broth. When I see the next Champagne for the evening, I am beside myself. 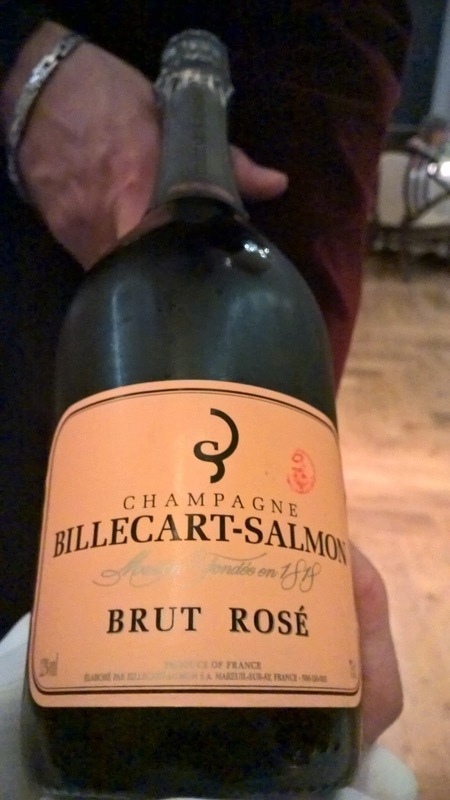 The NV Billecart-Salmon Brut Rosé is presented and poured. A special evening has just gone stratospheric. This is the most refined Champagne tonight, with the most delicate bubbles. A truly beautiful choice. As I sip on it, I seek words that capture the feeling and my mind stumbles across Mark Pollan, who in Bottled Wisdom said something to the effect that 'Confucius once said that eating plain rice, having water to drink and an arm for a pillow were enough for happiness. 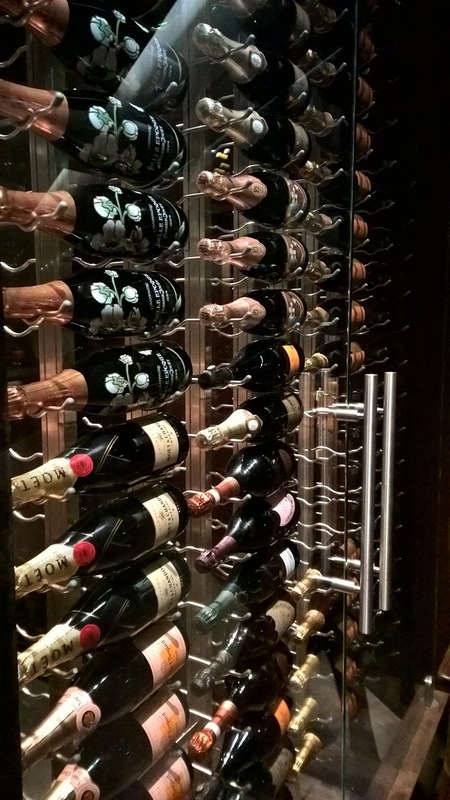 Confucius was a wise soul - but he did not ever taste Champagne.' (paraphrased) Tonight Bacchus is smiling kindly on me. 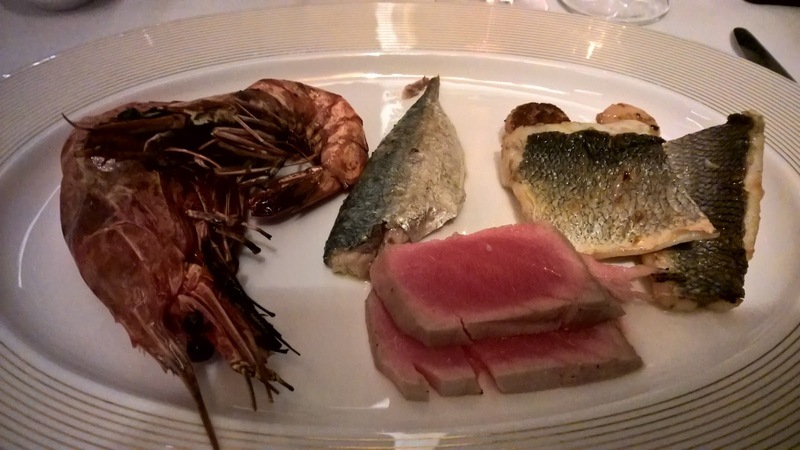 For our main course, we are served a Barbeque plate comprising a Mix of Seabass, Tuna, Scallops, Mackerel and Prawns. accompanied by a selection of sauces - lemon mayonnaise, romesco and chimichurri sauce. The highlights for me are the mackerel and tuna in so far as they sharply contrast each other. The tuna is all natural, apart from being lightly seared and the mackerel has its customary saltiness - I am sure you can imagine my delight at this variation of taste. Chef Francisco has shown his ability to meet the needs of diners without compromising on the essential tenets of the restaurant. I often hear people say that Abu Dhabi is not a market for fine dining and that people prefer relaxed and more laid back restaurants. To some degree they have a point. However, a night like this shows there is hope. A recurring mantra in some of my pieces is my disdain for the extent to which we have become too easy as people, living a microwave life. Every time I visit Catalan, I am reminded of the importance of slowing down and leaving the rat race, to indulge in an overused metaphor. It is an experience that connects me to a poem by WH Davies entitled Leisure that I read as a boy. It expounds the virtues of just being in a moment. I can count about three restaurants in Abu Dhabi that are able to take me to the place described above, and in a transient world, we should embrace these restaurants before they become watered down versions of what they could be, to appease a dining public afraid to step out of its comfort zone. I am so at ease in the ambience of Catalan even on a quiet night, but for those who need something livelier, evenings like tonight would have tremendous appeal. And also, price wise, you will not find an evening of such quality anywhere in the capital for this rate. It is time to watch beauty dance. Will you? Disclaimer: I consult at restaurants and hotels in an attempt to look at the entire product to take service levels to where they should be. 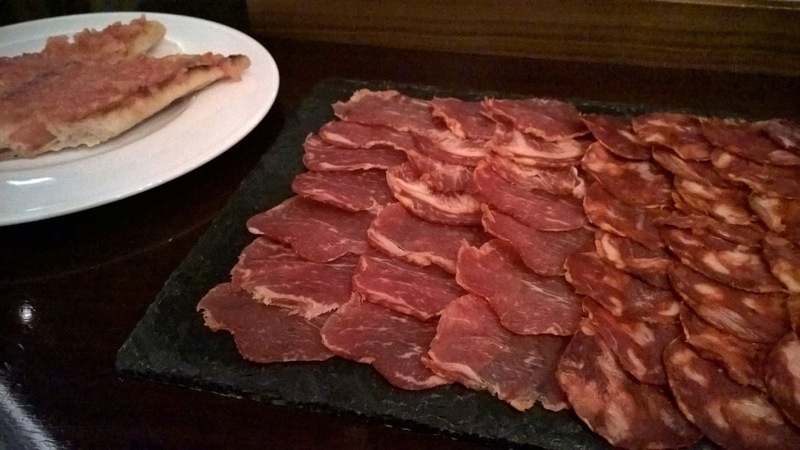 I visited Catalan as a guest of the restaurant.